Avida-ED Web 3.0 is out for beta release now. Rob Pennock gave a formal announcement at the Evolution 2016 meeting. Doesn't seem to work on iPad Chrome. Tablet compatibility wasn't the goal for this phase, but will be addressed later. The Avida-ED team is planning to get a ChromeBook and tablets for testing. I know it works on Chrome on Android 5.1, which is what my phone is. That's not a great use case, but being able to show it at all there is pretty cool for a demo. Diane's MacBook Pro that she does the UI development on had issues. When we were at the Apple Store in Tampa for repairs to it, we brought up Avida-ED on an iPad and an iPod there. Probably in Safari, which is not a good fit now because Safari refuses to allow saving blob data to local storage. Fixing that has been in the Safari developers issue list for a long time now. Anyone have any info about the whereabouts of Zach, or where one could get a copy of Gregor's Bookkeeper? Have you seen a site where this is done? On evoinfo.org Dembski proposes a solution for what he calls "partitioned search". But I am looking for a solution of what he names "proximity reward search", which apparently is the Weasel algorithm. To be clear, I am not interested in a numerical but analytical solution of the mean and variance as a functions of the above-mentioned parameters. Further up the thread, I pointed out the difference between partitioned search and "weasel". If you have the analytical form you like for partitioned search, then modify to add in the additional element I note for "weasel" and any other adjustments. I left off that project before fully working up the population component for probabilities. I've had some issues with hosted images going stale. I need to look up some of my graphs in this thread and restore them. And somewhere, sometime, I know I did a numerical scan of parameter space to show the likely range of parameters for Dawkins' original runs given his reported generation times for results. I'm not finding where I shared that, though. This is a linear law with respect to L if the other parameters are held constant. However, this does not match a Monte Carlo simulation, which shows that E is exponential with respect to L. So there must be some error in your calculation or I don't understand you well. Which Parameters should Dembski have used? The next configuration of a Markov chain only depends on the actual configuration and on neighboring sites, right? But the probability of a nucleotide sequence to achieve a target depends on all sites, that is, all sites must be correct. For example the third site of the sequence AAT is not correct if the target is AAA even though the first and second site are correct. So whether the target is achieved or not depends on all three sites. But maybe I don't understand exactly what is a Markov chain. Can you explain? Can you also explain what is on the abscissa and ordinate in your graphic? And what mean the lines? Some constant parameters? Edit: I'll look this over again. I derived it with Monte Carlo ground-truthing, so I'm not sure where we are diverging in expectation. I think the issue is that the expectation I derived in the equation is the expected number of correct bases in one possibly-mutated offspring. I have rechecked the equation with a new Monte Carlo analysis, and it checks out. Note that by the point we are mutating a string with 2 correct bases, we *expect* fewer than 2 correct bases afterward. Partitioned search mutation expectation is always greater than or equal to the starting correct number of bases. 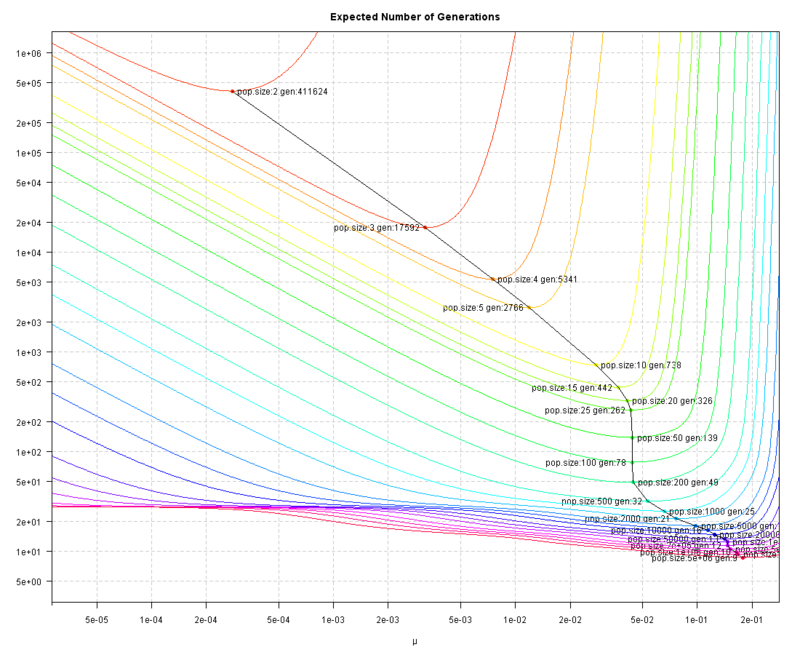 When we start talking about the expected number of generations to increment the best organism in the population to having another correct base, yes, that ends up in an exponentially increasing series with increasing number of correct bases. But the mutation expectation per offspring is a simpler calculation than that. I started to read Utiger's paper, he explains it quite well. I mean what we need is an equation for the mean number of generations necessary to achieve a target. For instance, for Dawkins' weasel sentence this number is around 60 or so for a population size of 100 and a mutation rate of 0.05 as explained on Wiki. where v is the number of generations and p = 1-q is the probability that the dice got the correct number. When several nucleotides and a population size greater than one is involved, p and q become matrices with the same dimension as the length of the sequence. The mean is calculated in the same manner than for dices. This way, Utiger found that the mean is a logarithmic law with respect to the sequence length if the population size is greater than one, otherwise it is exponential. He checks this with Monte Carlo simulations and both the analytical and numerical results perfectly fit. 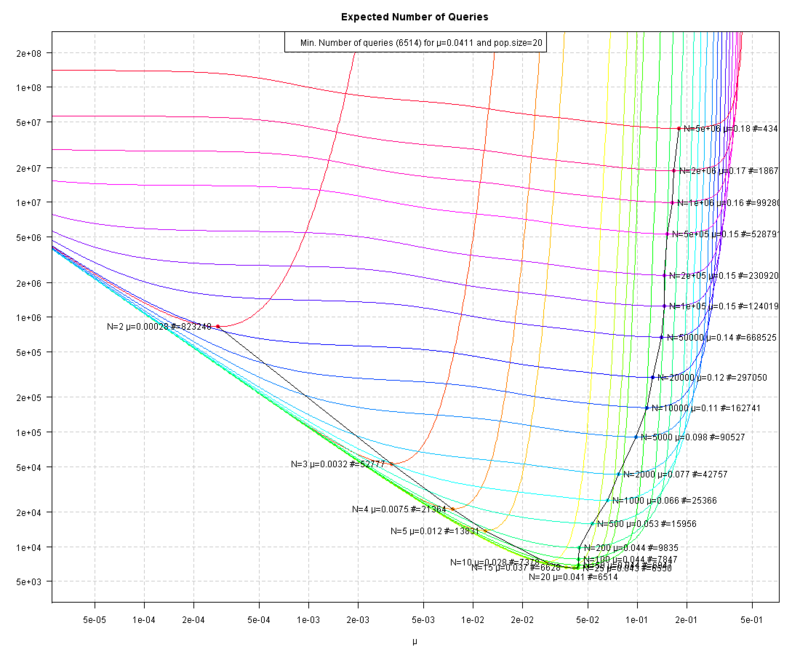 The graph answers the question "What is the expected number of queries for Dawkins's original weasel?" That is, the size of the alphabet (27) and the length of the target (28) are fixed. 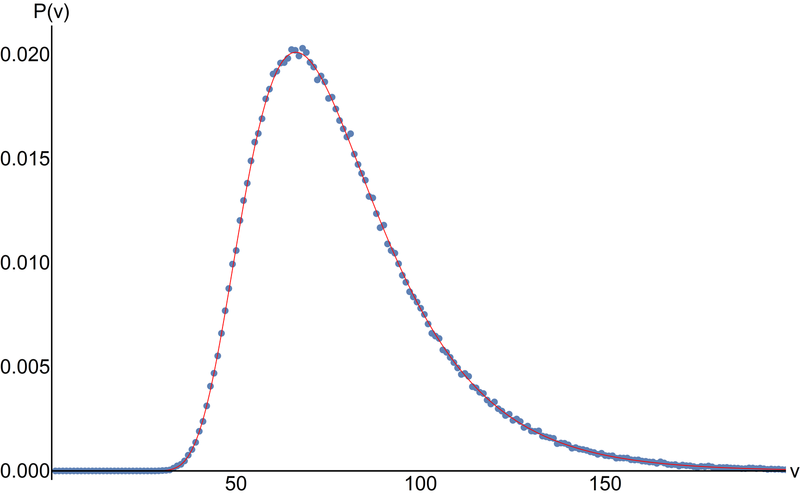 On the x-axis, there is the mutation rate \mu, on the y-axis, the number of queries, i.e., the size of the population times the number of expected generations. The black line connects the minimal points and allows for extrapolation - though this is quite difficult in this log-log diagram. When I calculated the values nearly eight years ago, I concluded that the most efficient size of population would be 9 with a mutation rate of 0.00901: this would result in 1576 queries on average (or some 175 generations). If I understand you well, a pop. size of 9 and mut. 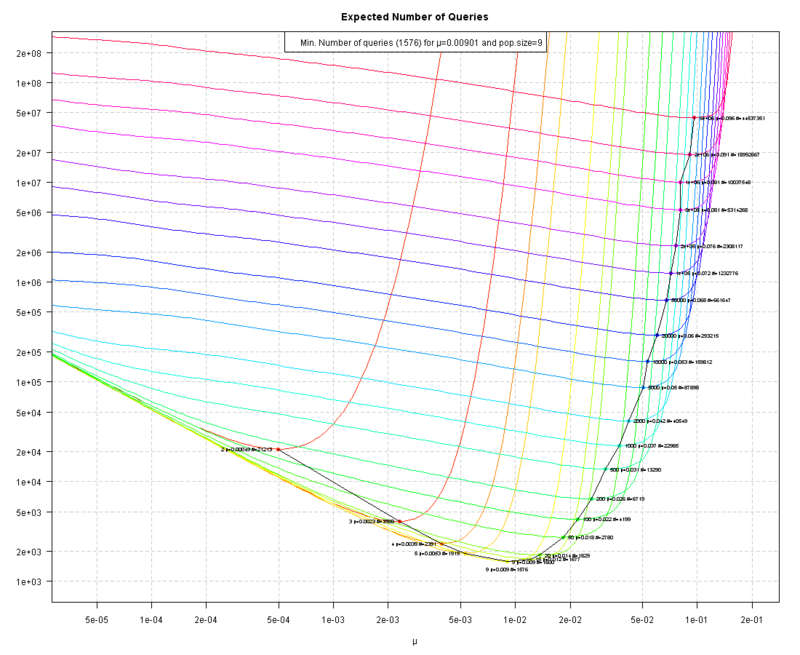 rate of 0.00901 yields a minimal average number of queries? There is an optimal mut. rate. But there is no optimal pop. size yielding a minimal number of trials. So the higher the pop. size, the lower the number of trials. Maybe it would be more useful if you only had the expected number of trials on the y-axis. Why take the number of queries? The general idea is that one wishes to reduce the costs of a simulation: you can define the idea of costs in various ways - maybe there is a restriction to the size of a generation and / or the number of generations - but it is standard to define the number of calls to the oracle / evaluations of the fitness function as the cost of a program. That's why I displayed the number of queries, i.e., the number of individuals created for which the fitness function has to be evaluated. The optimal mutation rate depends on the size of the population - there is no overall optimum for all sizes! The number of trials is the number of tries. When you roll dices for instance, a trial is when you throw the dice once. Or for the Weasel algorithm, it's the number of generations. where v is the number of generations and p = 1-q is the probability that the dice got the correct number. The paper can also be found on ResearchGate. If you really want to get a grip on the power and limitations of statistics I suggest Nate Silver's "The Signal and The Noise". My favorite quote: "Economists have predicted nine of the last six recessions". Berlinkski famously conflated the mathematical meaning of the word limit with the limit of actions available in the physical world. Personal incredulity unfortunately is a limit even for Mathemeticians. If his work was truly useful he could see if the strategy worked in Poker. I predict the results would see him lose. I have yet to see any mathematician change the outcome of a dice rolled in the past. I haven't gone through all of Utiger's math, but I can speak some to the biology interactions. Utiger attributes all change to natural selection. His paper is devoid of references to drift, and his only mention of Kimura is an offhand reference to mathematics. Thus, you can readily dismiss any conclusions he makes about plausibility of genetic change; he is not dealing with the full model of how genetics changes. Referencing Meyer as an authority on genetics is always a bad sign. Dieb, I don't think it is your error. The plot WebHopper has is for population size 100, and should have been run for population size 9 to speak to your numbers. Nevertheless, I'll look into it over the next week. Heck, I liked the picture, but something seems to be off. ARRRRGH! I don't know how I have managed it, but I uploaded two wrong pictures! Those belong to a blogpost from Oct 3, 2009 on Dembski's "Random Search" which had a target length of 100, and an alphabet of size 2 only! ii) I still think that the number of individuals created best reflects the cost of the algorithm - a least mathematically: the onerous task is to create/mutate a child, using random numbers - in this sense, 10 generations of 10 children are equally expensive as one generation of 100 children. Yes, that is absolutely standard.